The WE brand is owned by state-owned company Telecom Egypt, a monopolist in the fixed-line services sector. The network was launched in 2017 and now the operator has about 1.6 million connections. Provided that you choose a profitable tariff plan, the WE's starting plans can be used in GSM termination business. Prepaid subscribers can enjoy a Pay As You Go 12 PT offer from WE. 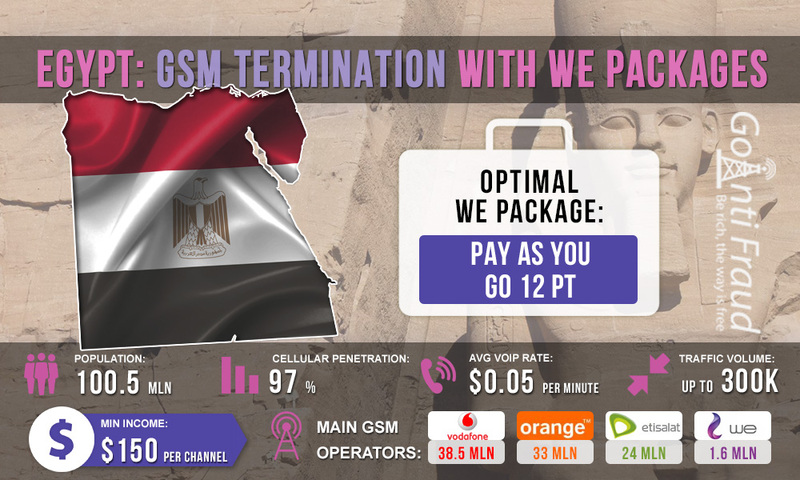 It offers $0.01 per minute for calls within Egypt. This is a fixed price for calls to mobile numbers of all networks and to landline numbers. LE 20. The subscription fee is $1.15. It provides for 1600 units. 1 unit = 1 minute of a national call / 1 megabyte of mobile Internet traffic / 1 SMS. LE 40. The subscription fee is $2.3. It provides for 4000 units. 1 unit = 1 minute of a national call / 1 megabyte of mobile Internet traffic / 1 SMS. The best solution to work in traffic termination business will be Pay As You Go 12 PT tariff plan. It provides cheap cellular communication to any numbers in Egypt, which allows getting the maximum profit on tariffs difference between international and local calls. To successfully earn on termination in Egypt, use GoAntiFraud tools to minimize the SIM blocking by the operator's antifraud systems. Our clients can additionally use the voip call recording software - the call recording software module to check the quality of supplied traffic, as well as IVR module and other useful software.